We only sell new, factory fresh, FM approved items. Would you risk your plant or building on a "rebuilt or reconditioned" item? 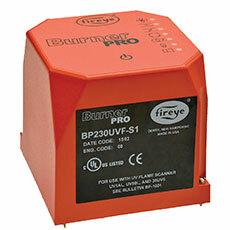 The Fireye BurnerPRO is a compact, microprocessor based, primary flame safeguard control system designed to provide the proper burner sequencing, ignition and continuous flame monitoring for on-off, multi-stage, or modulating burners used in commercial heating and process equipment firing oil and gas fuels. The system is designed for use in non-permanent operations that requires burner recycle at least once every 24 hours. Flame monitoring for the UV version is accomplished by the built in amplifier and compatible UV scanner. Control functions and timings are factory set via unique micro controller firmware. Through seven SMART LEDs, the control provides current operating status and lockout information in the event of a safety shutdown. A complete BurnerPRO system includes the BP110/230, flame scanner and wiring base. The BurnerPRO performs a safety self-test on every start. If a flame is detected prior to a start or during the purge cycle, the fuel valves are not energized and the control locks out. The LEDs and alarm terminal is used to annunciate the presence of a lockout condition. Type 25SU5 & 25SU3 are Surface Mounted Controls used in Conjunction with Type 45UV5, 45RM, 45FS, 45UVFS Flame Scanners. Fireye type 25SU5 model 5011, 5012, 5013 and type 25SU3 model 5166, 5168 controls are surface mounted controls used in conjunction with type 45UV5, 45RM, 45FS, 45UVFS flame scanners. These controls and scanners comprise a repetitive self-checking system that confirms flame presence and absence to provide reliable ignition and flame failure protection. When combined with appropriate auxiliary devices, these controls enable construction of integrated safety interlock systems for single and multiple industrial burner applications firing gas, oil, pulverized coal, or a combination of fuels continuously. The 5011, 5012, 5013, 5166, and 5168 Controls may also be installed in the safety control circuits of supervised manual, semi-automatic, and fully automatic burner management systems as the primary safety control. Wiring Base required: P/N 60-2206-1 (5011, 5012, 5013), P/N 6-2206-2 (5166, 5168). These flame safeguard controls monitor flame to supervise burner and pilot performance throughout the entire burner load range. Features include flame relay, master relay*, 0-3 VDC output, 2 scanner operation. Optional display module, P/N 60-2205: Includes bar graph display, marginal alarm with LED, flame relay LED, and 0-20mA DC output. * Type 25SU5 Model 5011, 5012, 5013 control only. Note: Flame Amplifier Modules 60-2207-1 and 60-2207-2 are operative in either of the chassis. The 60-2207-1 is a high sensitivity (flame amplification characteristics) amplifier for use on single burner applications with little or no background radiation. The 60-2207-2 is a high discrimination amplifier for use on single or multi-burner applications where background radiation is present (e.g. adjacent flame tips, hot refractory, etc.). The 60-2207-3 has the sensitivity of the 60-2207-1 but without the flame relay on:off hysteresis. This is suitable for applications where there is a very small difference between flame on and flame off signal strength. With the Fireye modernization adapter kits you can easily upgrade older 25SU3 and 25SU5 P-Series type controls to the newer 25SU5-5011, 5012, 5013 and 25SU3-5166, 5168 flame amplifiers. Two types of adapters are available; 60-2060-16 for 25SU5-5011, 5012, 5013 and 60-2060-17 for 25SU5-5066, 5168. The modernization adapters allow the 25SU5-5011, 5012, 5013 and 25SU3-5166, 5168 amplifiers to plug directly into the existing wiring base with little or no rewiring required. NOTE: When using line voltage scanner (45UV5, 45RM1 or 45RM2) you must not power more than one scanner from the same power (L) or shutter (1) terminal. When two line voltage scanners are used, the power (L) and shutter (1) terminals must be switched via external circuitry. If it is required that the two line voltage scanners be active simultaneously, instead of adapter P/N 60-2060-16, you must use wiring base P/N 60-2206-1 which is provided with separate terminals for the two scanners. Refer to Bulletin CU-28 . 25SU3 Model 5166, 5168 Control. Refer to Bulletin CX-743E . 1 An external master relay required. 2 New scanner and shielded cable required. Type 25SU5 and 25SU3 Control Parts and Accessories.